While you’re an expert at operating your equipment, do you really know how your typical day-to-day operations effect the inner workings of your machinery? Planning regular surveys of your equipment can help you better understand how different landscapes and activities affect your machinery, plan for necessary service downtime and prevent larger service issues. Once you have a better understanding of the current state of your equipment, you can take steps to mitigate any issues you find and be on a path to maximize the life of your equipment. In every field the cost of downtime far outweighs the cost of a good preventative maintenance plan. While you can’t prevent every issue, you shouldn’t let preventable issues stop your workday. When conducting an equipment survey, it’s vital to use a checklist to ensure that all parts of your machinery have been reviewed and checked over for wear and tear or major malfunctions. Make sure to include all hydraulics, your transmission and engine components. Use the first survey as a baseline to plan for how often you’ll need to conduct surveys in the future. Choose a regular interval to survey your equipment that works with your operation, your equipment manufactured recommendations and that you can commit to. The most important part of making an “effective” service plan that will extend the life of your logging equipment is to be proactive. Instead of reacting to issues as the occur in the field, planning for regular maintenance such as fluid analysis and engine diagnostics can help you eliminate downtime and increase the amount of productive hours you get with each piece of equipment. Regular inspection of your equipment increases the safety of your operations and can help you prevent serious malfunctions such as oil or coolant leaks that result in engine damage. Preventative maintenance keeps each piece of your equipment working as it should – allowing you to harvest more. Your plan should be based on your particular equipment, how easy it is to service, and the cost vs. benefit associated with servicing. In the long run, preventative maintenance on your machinery can add significant dollars to your bottom line. A local OEM or engine service dealer can also help you develop an on-going maintenance plan for your equipment or answer any questions you have about servicing a particular piece of equipment. Educate your workers – Teach them to look for key factors that indicate your equipment may be in need of service. This could be signs of lower performance, particular sounds or lower fuel efficiency. Plan ahead – Scheduling maintenance for power and hydraulic systems will keep those systems working more effectively. Make an individual service plan for each piece of equipment – You know how your equipment functions in your daily work environment better than anyone else. If there’s one piece of machinery that is used more frequently than other equipment on your jobsites or for longer hours, you may need to step up the service frequency for that that piece of equipment. Consider an outsourced service provider – To maximize the efficiency of your workforce, an outsourced maintenance provider may be a good solution. Using factory certified technicians and state-of-the-art equipment can ensure maintenance is completed on regular intervals and to factory standards, and helps keep you in line with your warranty. To increase your service plan’s effectiveness, one option is to stock key parts. For minor issues, having a stock of critical parts on hand can allow your team to make a quick fix. 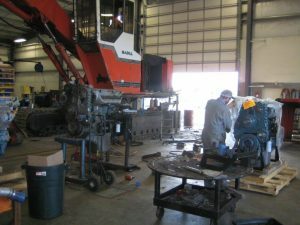 When your machinery has a serious malfunction, having parts available can have a large effect on your downtime and service costs. Take into account the current condition and remaining useful life of the piece of machinery. Since a remanufactured engine can add approximately 20,000 hours or more to your equipment’s life, you want to ensure it can last that long. With the value that remanufactured engines offer, you can save significant costs instead of making a large capital investment in new equipment. 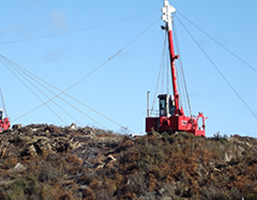 If you can repower for lower costs, those dollars can be reinvested elsewhere in your operation. Depending on the type of engine currently in your equipment, you can typically replace it with the same or similar remanufactured engine. This saves significant downtime for engineering that must occur when integrating a different type of engine. Repowering with a remanufactured engine also allows you to skip EPA End Product Questionnaire testing, which can take up to a week to complete. 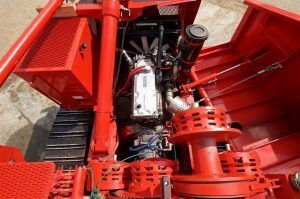 Consult your engine manufacturer, dealer or distributor for compliance with EPA regarding the use of a remanufactured or new engine in an equipment repower. In many cases you may be able to use an engine that requires little or no change to your equipment support systems. Reman engines are typically updated with the latest engine technologies and have been rebuilt to make them nearly good-as-new, while offering significant cost savings. Reman engines such as those made by Detroit Diesel can improve your equipment’s performance and dependability in the field, plus increase the years of service life you receive. They also can help your equipment operate safely and more reliable, and with better fuel economy. Making these practices a priority in your equipment program can help you extend the life of your equipment and see greater value for years to come.